Choosing a holiday is a big decision. We understand that before booking your cruise aboard Aegean Odyssey that you will want to know the philosophy behind Voyages to Antiquity. 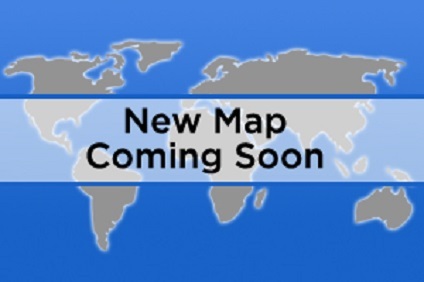 Our aim is to help you assess the meticulous planning of our itineraries, our policies aboard ship and the many features included in the price. We will create a cruise experience that is not only for the amateur or professional historian but also for people who simply want to understand the history, art, myths and architecture of the ancient world. 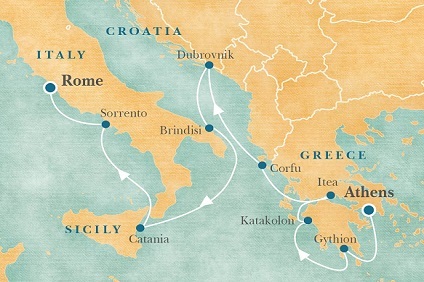 A Voyage to Antiquity cruise aims to open a window into the origins and genius of western civilisation. These journeys, however, are not only about history. As well as seeing breathtaking archaeological treasures you will also see some of the most beautiful scenery in the world and experience the magnificent food and wine of the Mediterranean. In contrast to the massive vessels cruising to and from the major ports of the Mediterranean, we have a mid-sized ship adapted for island and coastal cruising. This means that Aegean Odyssey can visit smaller, less crowded harbours and sail closer the coast enabling you to really appreciate the magical views. As we carry only an average of 350 passengers, our ship is ideal for those who dislike travelling around with hordes of people. This boutique-style cruising tends to be more expensive to operate than larger ships. If you like to avoid crowds, wander around beautiful islands, cruise remote inlets, visit charming villages and explore ancient sites that are inaccessible to others, then Aegean Odyssey is the ideal ship for you. 11 Night Cruise sailing from Athens roundtrip aboard Aegean Odyssey. Hotel stay pre-cruise in Athens. 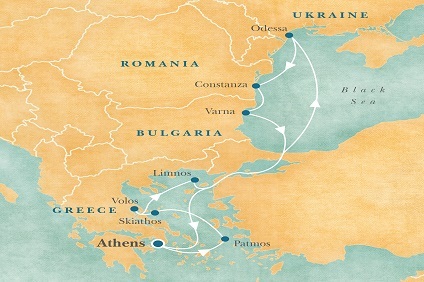 10 Night Cruise sailing from Athens to Rome aboard Aegean Odyssey. Hotel stays pre-cruise in Athens and post-cruise in Rome. 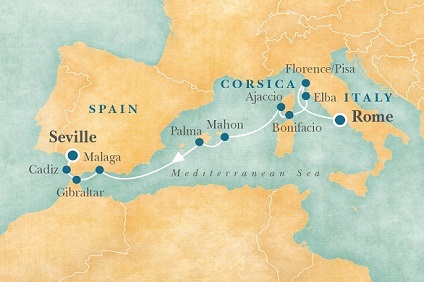 12 Night Cruise sailing from Rome to Seville aboard Aegean Odyssey. Hotel stays pre-cruise in Rome and post-cruise in Seville. 24 Night Cruise sailing from Rome to Tilbury aboard Aegean Odyssey. Hotel stays pre-cruise in Rome and post-cruise in London. 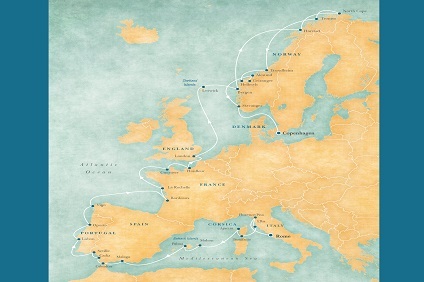 39 Night Cruise sailing from Rome to Copenhagen aboard Aegean Odyssey. Hotel stay pre-cruise in Rome. 52 Night Cruise sailing from Rome to Copenhagen aboard Aegean Odyssey. Hotel stay pre-cruise in Rome. 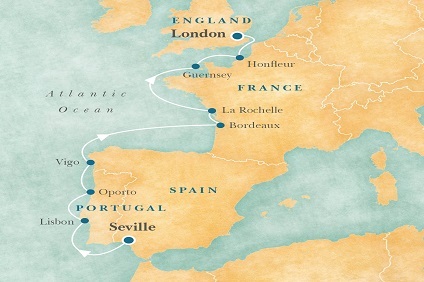 12 Night Cruise sailing from Seville to Tilbury aboard Aegean Odyssey. Hotel stays pre-cruise in Seville and post-cruise in London. 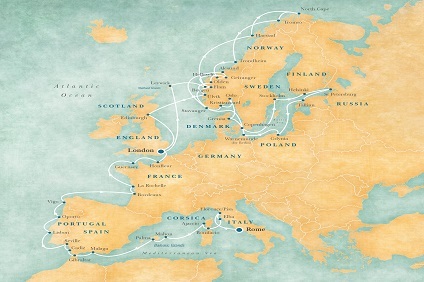 27 Night Cruise sailing from Seville to Copenhagen aboard Aegean Odyssey. Hotel stays pre-cruise in Seville. 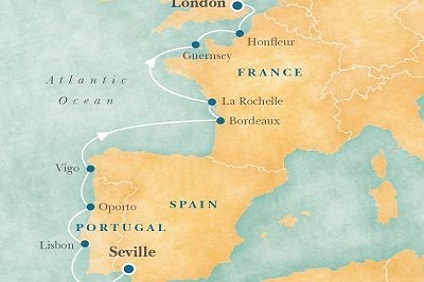 12 Night Cruise sailing from Seville to Tilbury aboard Aegean Odyssey. 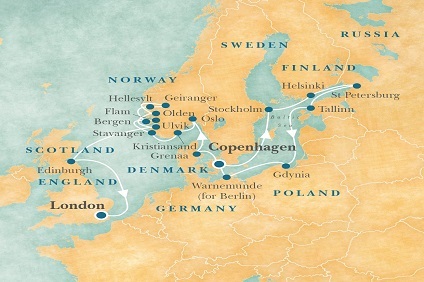 15 Night Cruise sailing from Tilbury to Copenhagen aboard Aegean Odyssey. Hotel stay pre-cruise in London. ** FLY FREE ** 30 Night Fly, Cruise & Stay from London to the Land of the Midnight Sun in Norway & the Baltic Sea, incl 3 days in St Petersburg! 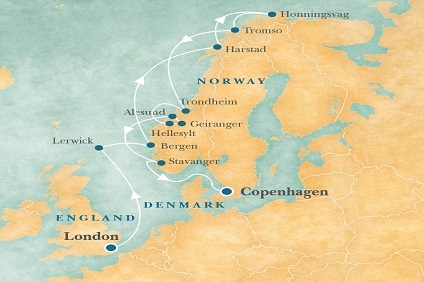 28 Night Cruise sailing from Tilbury to Copenhagen aboard Aegean Odyssey. Hotel stay pre-cruise in London. 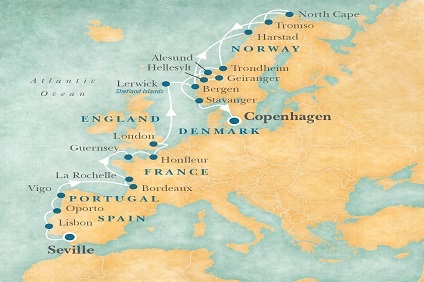 13 Night Cruise sailing from Copenhagen roundtrip aboard Aegean Odyssey. 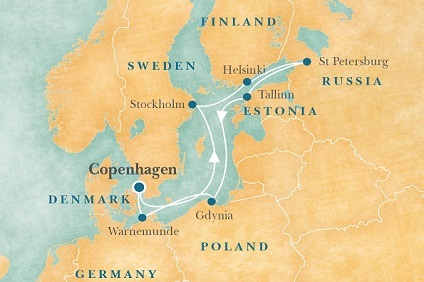 29 Night Fly, Cruise & Stay Copenhagen to London, from the Baltic Sea to the Fjords of Norway, incl 3 days in St Petersburg! 27 Night Cruise sailing from Copenhagen to Tilbury aboard Aegean Odyssey. Hotel stay post-cruise in London. As well as being one of the world’s most historically interesting and naturally beautiful destinations, the Mediterranean is also home to an unsurpassed culinary tradition. This gastronomic culture of using the very best fresh local ingredients cooked in a simple but delicious and healthy style is the inspiration for the three restaurants on Aegean Odyssey. The most formal of the ship’s restaurants, the Marco Polo, has a full waiter service, casual country-club elegance (a jacket is suggested at dinner) and Mediterranean influenced food. At lunchtime, you can choose from a variety of starters such as Parma ham and melon or tricolore salad, three dishes of the day including grilled fish, a pasta special and a choice of desserts, fruit and cheese. In the evening, dinner will include appetisers, soup, salads, a choice of three or four main courses and desserts (see menu). The complimentary house wines are carefully sourced from Italy, Croatia, Sicily and Greece. There is also a full wine list of superior vintages available. With a combination of indoor and outdoor seating, sophisticated Mediterranean interior design and cooking on the open grill, the Terrace Café replicates the charm and ambiance of a seaside trattoria. As well as the grill, there is a large buffet with hot dishes of the day, a selection of salads, Italian antipasti such as bruschetta, beef carpaccio or fresh mozzarella drizzled with virgin olive oil. Pasta is served with a choice of homemade Italian sauces and for dessert there is a large selection including ice creams. For liquid refreshment there is a wine and aperitif bar. The day starts in the Terrace Café with breakfast when you can either enjoy a healthy combination of yoghurt, fruit and muesli or indulge in eggs, bacon or omelette. In the evenings, Tapas on the Terrace recreates the informal yet sophisticated atmosphere of a Mediterranean bistro. Here you can choose from a selection of mouth-watering appetizers, try our delicious seafood paella or pick from the wide-range of authentic Italian pizzas. Equal care has been given to the selection of the wines served at Tapas on the Terrace; these will be served at your table by our helpful waiting staff. There is something magical about the tradition of taking tea at sea. On afternoons when you are not ashore, a selection of freshly prepared sandwiches, cakes and scones will be served in the Observation Lounge. Accompanying these is, of course, a selection of refreshing teas and a choice of coffees. A cup of Darjeeling, a slice of freshly baked cake and the panoramic views of the Mediterranean: the perfect combination. If you prefer to start your day in the comfort of your cabin, then our room service staff will be happy to bring a continental breakfast. There is also a limited room service menu available throughout the day from noon to midnight. For those passengers enjoying a late night discussing the excitements of the day's sightseeing, a selection of light snacks freshly prepared by our chefs will be available in the Lido and Rendezvous bars. Gratuities are included in cruise fare - service charge of 12.5% added to all bar service bills. 12. There are no childrens facilities onboard the Aegean Odyssey.